Today I was on leave and, the weather being bad, thought I’d do a bit of catching up on the news. And so it was that I found, on the Stuff FB page, an item about the (lack of) funding for cutting-edge cancer drugs. So far, so innocuous (although also somewhat sad) – until I read the comments. maternity spending is too high, time to pull the purse strings in and start putting some of that money into [funding for cancer drugs]. Ladies do not bleat on that you need it, 1950, 1960, 1970 gee less money, babies still lived. 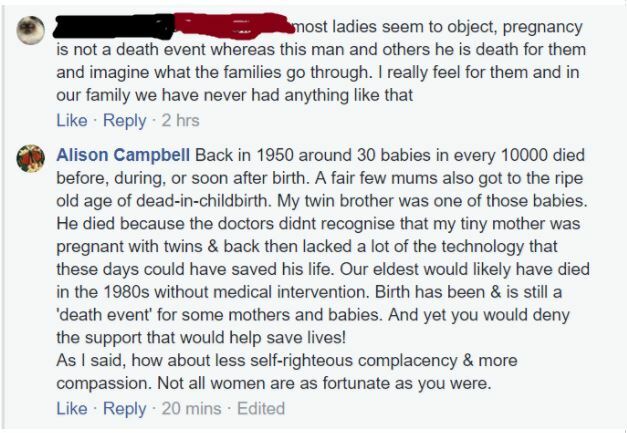 I thought this was a bit heartless, and pointed out that neonatal mortality rates were 4 times higher in 1964 than in 2010; it’s a safe guess that increased funding for maternity and post-natal care contributed to that. Indeed, Black did continue her claims that there’s too much spent on maternity. 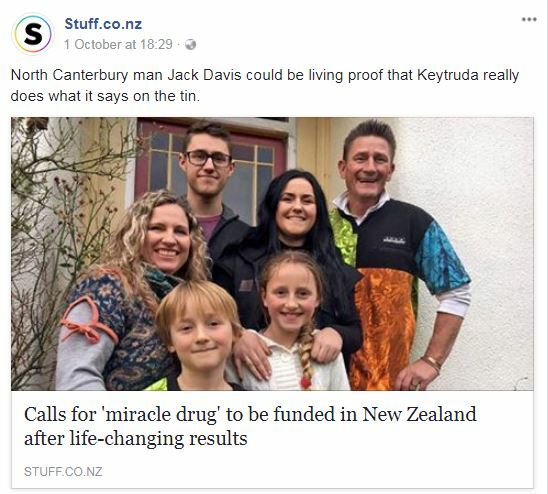 I responded that the money spent on maternity benefits a large number of people, while cancer drugs like Keytruda (the subject of the Stuff story) are always going to be expensive and used by relatively few. At some point there has to be a cost-benefit analysis, which is reflected in what the government does & doesn’t fund; there are always going to be newer and better drugs and we probably are never going to be able to afford all of them and still provide all the other elements of a comprehensive public healthcare system. Shortly after that Black told me I was a “nut case” and blocked me. We’ve come a long way since the 1950s in terms of the health care delivered during pregnancy and around and after birth. It’s sad to see that there are people who, because their own experiences apparently were never unpleasant or potentially dangerous, now feel that the current level of funding is too much. It’s also a pity that, if the comments on that Stuff article are anything to go by, we still don’t seem able to have a grown-up discussion around the costs of health care and the hard decisions that need to be made around funding of various aspects of that care. Talk of costs and benefits can sound cold, when faced with individual stories of human suffering, but it’s still a discussion that we need to have. 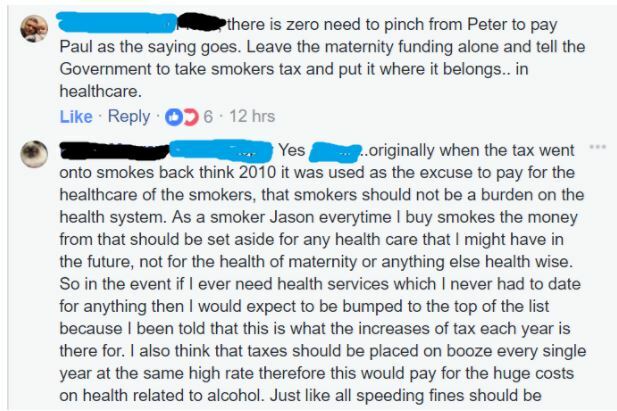 And if smokers really believe that cigarette tax should go towards health care of smoke-related conditions, then maybe we should be opening up a discussion about whether the cigarette tax is currently high enough to cover the healthcare costs? When my daughter Megan was stillborn I received top quality care (although I did still have to deliver her in a delivery suite where, cruelly, you could hear other Mums delivering their live babies; I was also subsequently admitted to the post-natal ward where – more cruelty – other Mums were celebrating their first days with their newborns, while I lay curled up without my baby – so it’s not like there was an EXCESS in funding at that point!). Nevertheless, I was so, so grateful to be in a country where medical care was available – and where that care was available through subsequent pregnancies as well! In fact, I’ve often thought how grateful I am to pay taxes towards those costs … because it means care for me and for others, as well as police officers, teachers, WINZ support for those who need it, etc. etc. Of course it’s never going to be enough – until as a country we vote for higher taxes. And I ache for those in life-limiting and life-threatening situations where adequate support is not provided, or where there is not funding for interventions that could make a difference. I regularly support families struck by hardship via the fantastic ‘Givealittle’ platform. I struggle to comprehend how difficult some decisions must be to make when there is a limited health budget. And I abhor the thought of inefficiencies in the medical system. 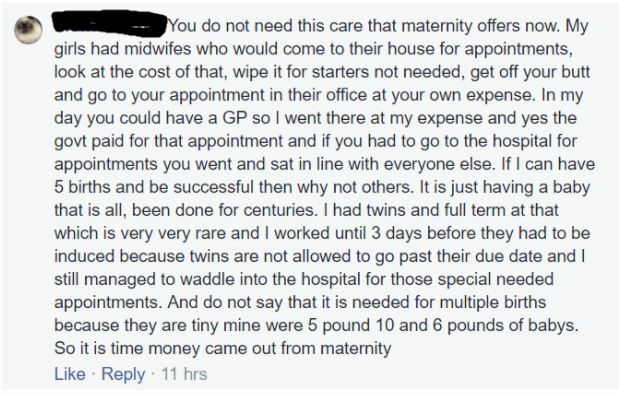 But having said all that, I am so, so grateful that there IS antenatal care available for those of us who access it willingly, AND for those who are more cavalier about the wide range of things that can go wrong – including, tragically for too many families, death or long-term disablement caused by medical misadventure. Thanks, Cathy <3 I will confess that you were at the front of my mind when I wrote this. I'm perfectly happy to continue to be a 'nut case' for causes like this one! Well done, but you came up against one of the most common thinking mistakes – the assumption that one’s own experience can be generalised out and assumed to be true for others. Hi Ross – I know; it’s so frustrating! Starting to think that we should formally teach critical thinking as a subject in its own right, instead of embedded in eg the ‘nature of science’ strand in the science curriculum.